1745 was not a good year for Handel. Two-thirds of the way through his musical season the finances were so bad that, had he continued, Handel could have found himself near to bankruptcy. Once again he had misjudged the requirements of his musical public: there was no longer the desire for the number of oratorio performances he had scheduled, and the result was that not only was the composer’s bank balance in a terrible state but so was his health. The sixty-one-year-old Handel left London and retired to the country to recuperate, first to the seat of the Earl of Gainsborough, Exton Hall in Leicestershire, and then to Scarborough. In national politics a greater crisis was brewing. Whilst King George II was away in Hanover, Prince Charles Edward, the Young Pretender, landed with his army in Scotland and started to march south. The English army was hastily recalled from Flanders, but when Bonnie Prince Charlie was victorious at the battle of Prestonpans in September and continued to press south, in certain quarters of London near panic set in. Under the leadership of the Duke of Cumberland, the son of George II, the English army moved northwards to confront the enemy, supported by a patriotic fervour that had not been seen in the capital for many years. Songs were written to support the army, including the present National Anthem, and the resident composer at the Haymarket Theatre, Gluck, contributed a suitably heroic drama, La Caduta de’ Giganti (which was greeted with as little enthusiasm as had been Handel’s concert season). Handel, by now the recipient of a pension from the royal court, felt it necessary to make his own musical contributions but, despite the Jacobites’ defeat at Derby in December, the year ended with the political situation still very much in the balance. Matters were not finally resolved until well into the next year when Cumberland routed the invading forces at the decisive battle of Culloden, earning his nickname of ‘Butcher Cumberland’. So, to raise flagging spirits in London, a major musical work was called for. Handel’s new work seems to have been composed in something of a hurry and, as always, the composer was not afraid to recycle good material from earlier works. Confusion has surrounded who was the librettist for the Occasional Oratorio. A footnote under the air ‘O liberty, thou choicest treasure’ in the first edition of Judas Maccabaeus (which received its opening performances in April 1747) reads: ‘The following air was design’d, and wrote for this Place, but it got I know not how, into the Occasional Oratorio, and was there incomparably Set, and as finely executed.’ The author of Judas was Thomas Morell, yet all the other indications are that Hamilton Newburgh was Handel’s librettist for the Occasional Oratorio. Perhaps Morell was already at work on Judas and Handel, working flat out on what was now the more urgent composition, simply lifted the movement, together with Morell’s words, and installed it amongst Newburgh’s text. (Curiously, ‘O liberty’ was only inserted into Judas at the third performance.) The inclusion in Act II of music (and text) lifted directly from Athalia and in Act III from Israel in Egypt suggests that Handel was unconcerned in mixing the work of a number of authors. Despite that tirade, written perhaps not without a hint of professional jealousy (Jennens had, after all, worked three times already as an oratorio librettist with Handel, including Messiah), the General Advertiser of 14 February 1746 announced that, ‘At the Theatre-Royal in Covent-Garden, this day will be perform’d A New Occasional Oratorio’. Further performances were given on 19 and 26 February, and the work was revived (with some revisions) three more times in March the following year, just before the first performances of Judas Maccabaeus. Only three soloists, as we have seen, were named for the 1746 performances, but at least one other soloist must have been present, if only to sing the duet ‘After long storms’. In 1747 both Elisabetta de Gambarini and Caterina Galli took part as sopranos, a precedent we have used in this recording, and we have also allocated two low-set arias to an alto: otherwise the performing edition for this recording presents the movements heard in the 1746 performances. You are mistaken as to the Occasional Oratorio, which is most of it transcrib’d from Milton & Spencer, but chiefly from Milton, who in his Version of some of the Psalms wrote so like Sternhold & Hopkins that there is not a pin to choose betwixt ’em. But there are people in the world who fancy everything which has Milton’s name to it. I believe Hamilton has done little more than tack the passages together, which he has done with his usual judgement & cook’d up an Oratorio of Shreds and patches. Jennens was, with his own admission that he was not going to attend any performances, ensuring that he wrote with the same disadvantage under which other writers since have laboured: he had to judge Handel’s work without actually hearing it. Even if we accept some of his criticisms of the libretto, we do the work a disservice by approaching it with the expectation of finding a rip-roaring, operatic drama. Instead, Handel presents a series of dramatic tableaux. 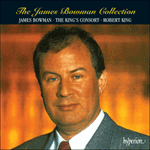 We find some terrific choruses, six first-rate orchestral movements and a fine variety of arias. For those who additionally enjoy a spot of Handelian detective work, there are a profusion of musical trails to follow. 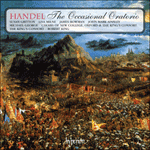 Here, in brief, is another splendid and unjustly neglected Handel oratorio. The overture to the Occasional Oratorio is a strong, four-movement one. The opening Grave and the fine ensuing fugue had probably been written for the 1744 revival of Deborah: the Allegro also contains a theme from the overture to Telemann’s Troisième Production of the Musique de Table, a source to which Handel also turned in the organ concertos. Newly composed was the third movement, a B minor Adagio with a glorious line for Handel’s principal oboist. 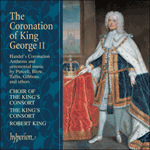 With the work’s wartime origins in mind, Handel concluded with a stirring military March. In the interests of getting straight on with the drama, Handel forgoes an opening chorus, presenting instead the bass solo ‘Why do the gentiles tumult’ whose strong rhythms, repeated string figurations and woodwind interpolations set a suitably militaristic tone. The choir enters with the first of three crusading choruses, the swaggering rhythms of ‘And cast from us’ capped by the delayed entry of trumpets and drums. The tenor takes a gently heroic role in the oratorio, and his opening aria ‘O Lord, how many are my foes’ is an especially appealing one, with repeated string chords complemented by another delicious oboe solo. The chorus responds with another, much truncated version of ‘Him or his God we not fear!’, to which the tenor responds with another supplicatory aria, ‘Jehovah, to my words give ear’, duetting this time with a solo cello. The chorus ends the first episode with another repeat of the swinging battle chorus, the urgency of mood reflected by the presence of trumpets and drums from the outset. The next scene is announced by the bass, continuing the paraphrase of bellicose words from Psalm 2. The soprano’s first entry is a gentle one, with the aria, ‘O, who shall pour into my swollen eyes’ lamenting the failings of the world; but she too takes up the warlike theme with the fiery aria ‘Fly from the threat’ning vengeance, fly!’, whose virtuoso runs must have delighted the singer in the first performances, La Francesina (the French soprano Elisabeth Duparc). The movement was a borrowing from the 1745 performances of Samson where Miss Robinson, granddaughter of the famous Purcellian countertenor William Turner, sang it with its original text, ‘Fly from the cleaving mischief’. The solo bass (originally Thomas Reinhold) returns with the accompagnato ‘Humbled with fear’ and the splendid aria ‘His sceptre is the rod of righteousness’: the reintroduction of harmony after unison passages for singer and strings makes the ‘great Dragon’ that ‘strongly doth repress’ all the more picturesque. The middle section is a fine contrast, noble in its hymn-like melody; keeping the drama moving, Handel re-writes and shortens the first section, rather than offering a complete ‘da capo’. The soprano solo ‘Be wise, be wise at length, ye kings averse’ is a delight, lilting gently with a simple continuo line before it is transformed into an equally appealing chorus. But the peaceful mood does not last and the four ‘Grave’ bars of ‘Or brought full low’ lead into another warlike chorus section, where the enemy are ‘Scatter’d like sheep’ and perish ignominiously. In ‘Jehovah is my shield’ the tenor sings of his confidence in God, the orchestral texture fleshed out by a rich viola line. Handel’s depiction of ‘I lay and slept’ is especially fine. The chorus calls that the enemy be soundly defeated in a movement based on material from the F major concerto ‘a due cori’, whose scoring for horns (making their only appearance in the oratorio adaptation) ensures that Act I ends in belligerent mood. Handel’s next borrowing was rather more extensive, although it was at least taken from one of his own compositions. In Athalia ‘Around let acclamations ring’ grandly greets the newly crowned Joas. In the Occasional Oratorio, with a new text, ‘May God, from whom all mercies spring’, the movement is equally spectacular in its eight-part choral texture and fulsome orchestration. The tenor aria ‘Then will I Jehovah’s praise’ also has its origins in another work, the Masque Comus: during his recuperation in the summer of 1745 at the seat of the Earl of Gainsborough Handel contributed a handful of movements to the finale of a score which was largely by Arne. The following chorus was lifted from the same masque, its words changed from the original ‘Happy plains’ to ‘All his mercies shall endure’. Next comes a charmingly lilting soprano solo, ‘How great and many perils do enfold’ which is followed by the delightful duet ‘After long storms’, strongly redolent of the early Italian duets. The bass solo ‘To God, our strength’ is a jewel. The solemn opening, with high trumpet over slow-moving strings, harks back nearly thirty years to the delicious opening of the Birthday Ode for Queen Anne, ‘Eternal source of light’. This time Handel answers the trumpet with a solo oboe, and the two wind players engage in a private duet before the solo bass presents glorious music. Here is Handel at his most captivating. At ‘Prepare the hymn’ the mood changes to a more steadfast, processional one, and Handel introduces the Lutheran chorale melody ‘Ein feste Burg’. The composer marshals his build-up magnificently, presenting the theme first in the solo bass, then with the full chorus. Finally the full ensemble, complete with ringing trumpets and timpani, celebrates in rousing style. The tenor solo which follows, ‘He has his mansion fix’d on high’, was also borrowed from Comus, and leads to a stirring choral conclusion to Act II, ‘Hallelujah, your voices raise’. The fugue which is introduced at the mid-point, ‘Jehovah, Lord of hosts’, is a fine one. The third part begins with an extensive, two-part orchestral symphony. The first section is taken from the first movement of the Concerto Grosso in G, Opus 6 No 1. For his second movement Handel turned to the Musette of his Concerto Grosso in E flat, Opus 6 No 6, which in its rich string scoring and glorious melodies bears striking resemblances to Corelli’s famous ‘Christmas Concerto’. The chorus that follows, ‘I will sing unto the Lord’, is one of Handel’s most thrilling, borrowed lock, stock and barrel from Israel in Egypt. Scored for double choir this is hugely dramatic music, flinging its themes from part to part, and saving the hair-raising entry of the brass to the last few pages. Also taken from Israel in Egypt was the fine alto solo ‘Thou shalt bring them in’, now transposed up a semitone into F major to lead into another splendid chorus from the same oratorio. With its ‘Grave’ opening scored in sixteen parts, ‘Who is like unto thee’ is as sensational as ‘Lord of eternity’ in Deborah, and leads into one of the composer’s best-known choruses, ‘He gave them hailstones for rain’. The orchestral opening, firing a C major chord between the strings and woodwind (complete with a vulgar bottom C for the bassoons), builds into the entry of the two opposing choruses, who indulge in nothing short of musical warfare, driven on by a wild orchestral accompaniment. Handel’s timpanist must have had a field-day! 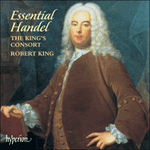 After such choral fireworks Handel returns to solo movements. The soprano takes ‘When warlike ensigns’, nicely varied in its moods and, with its pastoral bagpipes at ‘No pasture now the plain affords’, also including another oblique reference to ‘Rule Britannia’. The lure of Israel in Egypt proved unstoppable and for ‘The enemy said’ Handel again lifted the complete movement, ensuring that his tenor soloist was offered the opportunity for vocal pyrotechnics alongside the other, more lyrical arias of the Occasional Oratorio. For the bass Reinhold Handel produced a blustering setting of ‘The sword that’s drawn’ which leads into a spirited chorus, ‘Millions unborn shall bless the hand’. For La Francesina he wrote a charming setting of ‘When Israel, like the bounteous Nile’, and for John Beard a final, defiant aria (marked ‘pomposo’), ‘Tyrants, whom no cov’nants bind’. Before the finale the soprano calls for ‘balmy peace’ to descend on England’s battle-hero, once again recycling a charmingly melodic aria from Comus. It is left to the choir to introduce the final celebrations, which it does with Handel’s most famous chorus of all, the coronation anthem ‘Zadok the Priest’, here reworded ‘Blessed are all they that fear the Lord’, and omitting the triple-time middle section ‘And all the people rejoiced’. If English hearts were going to be stirred, surely no music would have carried out the task better. 1745 n’avait pas été une bonne année pour Haendel. Aux deux tiers de la saison musicale, ses finances étaient si mauvaises que, s’il avait continué, Haendel aurait pu être à la faillite. Encore une fois, il avait mésestimé les exigences musicales de son public, exigences qui ne justifiaient guère le nombre de représentations d’oratorios qu’Haendel avait mis au programme; en conséquence non seulement l’état du compte bancaire du compositeur était au pire, mais encore sa santé. Haendel avait soixante et un ans lorsqu’il quitta Londres et se retira à la campagne pour récupérer, d’abord au château du Comte de Gainsborough, à Exton Hall dans le comté de Leicestershire, puis à Scarborough. Du point de vue national, une grande crise politique était en pleine effervescence. Pendant que le Roi Georges II était en voyage à Hanovre, le Prince Charles Edouard, le Jeune Prétendant, débarqua en Ecosse avec son armée et se mit en marche vers le sud. On a dû rappeler de toute urgence l’armée anglaise des Flandres, mais lorsque Bonnie Prince Charles remporta la bataille de Prestonpans en septembre et prit la direction du sud, ce fut presque la panique dans certains quartiers de Londres. Sous le commandement du Duc de Cumberland, l’armée anglaise avança vers le nord pour faire face à l’ennemi, soutenue par une ferveur patriotique que la capitale n’avait pas vue depuis de nombreuses années. On écrivit des chansons pour soutenir l’armée, dont l’hymne national actuel, et le compositeur résident du Théâtre de Haymarket, Gluck, réagit en présentant un drame héroïque approprié, La Caduta de’Giganti (qui reçut aussi peu d’enthousiasme que la saison de concerts d’Haendel). Haendel, dès lors pensionné de la cour royale, se sentit obligé d'apporter ses propres contributions musicales, mais, malgré la défaite des Jacobites à Derby en décembre, l’année termina dans l’instabilité politique car la guerre n’était pas encore gagnée. Ce ne fut que vers le milieu de l’année suivante que Cumberland, le fils de Georges II, assura la victoire en déroutant l’invasion de l’armée à la bataille décisive de Culloden, et y gagna son surnom de «Boucher de Cumberland». Ainsi il fallait une œuvre musicale importante pour remonter le moral fléchissant de Londres. La nouvelle œuvre d’Haendel semble avoir été composée assez rapidement car, comme toujours, le compositeur n’a pas hésité à recycler certains bons morceaux d’œuvres précédentes. L’identité du librettiste de l’Occasional Oratorio a toujours prêté à confusion. Un renvoi en bas de page de l’air «O liberty, thou choicest treasure», dans la première édition de Judas Macchabée (dont les premières représentations ont été données en Avril 1747) rapporte: «L’air suivant a été conçu et écrit pour cette Place, mais je ne sais pas comment il a été si admirablement incorporé dans l’Occasional Oratorio et si brillamment exécuté.» L’auteur de Judas était Thomas Morell, pourtant tout indique qu’Hamilton Newburgh était le librettiste d’Haendel pour l’Occasional Oratorio. Il est possible que Morell travaillait déjà à son Judas et que Haendel, qui travaillait d’arrache-pied à la composition la plus pressante, simplement prit ce mouvement, avec les paroles de Morell, pour le placer au milieu du texte de Newburgh. (Curieusement, «O liberty» n’a été inséré dans Judas qu’à la troisième représentation.) L’inclusion dans l’Acte II de la musique (et des paroles) d’Athalia et dans l’Acte III d’Israël en Egypte suggère que le mélange de paroles de plusieurs auteurs ne gênait nullement Haendel. Malgré cette tirade, peut-être écrite non sans un soupçon de jalousie professionnelle (après tout, Jennens avait déjà travaillé à trois livrets avec Haendel, dont le Messie), le General Advertiser du 14 février 1746 annonçait que «Au Théâtre Royal à Covent Garden, ce jour sera représenté un Nouvel Occasional Oratorio». D’autres représentations en ont été données les 19 et 26 Février et l’ouvrage a été rejoué (avec quelques révisions) trois fois de plus en mars l’année suivante, juste avant les premières représentations de Judas Macchabée. Seuls trois solistes, comme nous l’avons vu, étaient nommés pour les représentations de 1746, mais au moins un autre soliste doit avoir été présent, si ce n’est que pour chanter le duo «After long storms». En 1747, les deux chanteuses Elisabetta de Gambarini et Caterina Galli ont pris les rôles de sopranos, un exemple que nous avons utilisé dans cet enregistrement et nous avons aussi assigné deux arias de ton plus grave à un alto: autrement l’édition de cet enregistrement présente les mouvements entendus aux représentations de 1746. Vous vous trompez en ce qui concerne l’Occasional Oratorio, qui dans sa plus grande partie est transcrit de Milton & Spencer, surtout de Milton; dans sa Version de certains Psaumes, Milton écrivit de façon si semblable à Sternhold & Hopkins qu’on n’en peut discerner la moindre virgule. Mais il existe au monde des gens qui aiment tout ce qui porte le nom de Milton. Je pense qu’Hamilton n’a rien fait d’autre que de bâtir les passages ensemble, ce qu’il a fait avec son jugement habituel, et de créer un Oratorio fait de pièces et de morceaux. Jennens, tout en admettant lui-même qu’il n’irait assister à aucune représentation, sans aucun doute écrivait avec les mêmes handicaps que d’autres écrivains ont depuis endurés: il devait juger l’œuvre d’Haendel sans l’avoir en fait entendue. Même si nous acceptons certaines de ses critiques du livret, nous portons préjudice à cet ouvrage si nous nous en approchons avec l’idée d’y trouver un opéra au drame tumultueux. En fait, Haendel présente une série de tableaux dramatiques. Nous y trouvons des chœurs fantastiques, six mouvements orchestraux de première classe et une excellente variété d’arias. Pour ceux qui de plus aiment un peu de travail de détective haendelien, on y trouve une profusion de pistes musicales à suivre. Bref, voici un autre splendide oratorio d’Haendel, injustement négligé. L’ouverture de l’Occasional Oratorio est une ouverture forte, à quatre mouvements. Le Grave du commencement suivi par une belle fugue a probablement été écrit pour la reprise de Déborah de 1744: l’Allegro aussi contient un thème de l’ouverture de la Troisième Production de Telemann de la Musique de Table, une source dont Haendel s’inspira aussi dans ses concertos pour orgue. Le troisième mouvement est une nouvelle composition, un Adagio en si mineur avec une ligne glorieuse pour l’hautboïste principal d’Haendel; et pour ne pas oublier que la guerre était à l’origine de son œuvre, Haendel conclut par une Marche militaire vibrante. Afin de démarrer directement en plein drame, Haendel renonce au chœur d’ouverture, et présente à la place la basse en solo «Why do the gentiles tumult», dont les rythmes forts, les embellissements répétés des cordes et les interpolations des bois suivent un ton militariste approprié. Le chœur attaque le premier des trois choœrs de combat, où les rythmes conquérants de «And cast from us» sont couronnés par l’entrée retardée des trompettes et des tambours. Le ténor prend un rôle preux et héroïque dans l’oratorio et son aria d’ouverture «O Lord, how many are my foes» est particulièrement attrayante, avec ses accords répétés par les cordes et couronnés par un autre ravissant solo du hautbois. Le chœur répond avec une autre version très tronquée de «Him or his God we not fear», sur lequel le ténor répond avec une autre aria de supplication. «Jehovah, to my words give ear», en duo cette fois-ci avec le solo d’un violoncelle. Le chœur finit le premier épisode par une autre répétition du chœur au rythme bataillant; l’urgence de leur ton est reflétée dès le début par la présence des trompettes et des tambours. La scène suivante est annoncée par la basse, qui continue sa paraphrase des mots belliqueux du Psaume 2. La première entrée du soprano est douce; avec l’arioso «O, who shall pour into my swollen eyes», elle lamente les manquements du monde, pour reprendre aussitôt le thème guerrier avec l’aria ardente «Fly from the threat’ning vengeance, fly!», dont les tirades virtuoso doivent avoir enchanté la chanteuse des premières représentations, La Francesina (le soprano français Elisabeth Duparc). Le mouvement était emprunté des représentations de Samson de 1745, où Miss Robinson, petite-fille du fameux contre-ténor purcellien William Turner, le chantait dans sont texte original, «Fly from the cleaving mischief». La basse en solo (à l’origine Thomas Reinhold) revient avec l’accompagnato «Humbled with fear» et la splendide aria «His sceptre is the rod of righteousness»: la réintroduction de l’harmonie après des passages en unisson de chant et cordes rend le «great Dragon» qui «fortement réprime» («strongly doth repress») des plus pittoresques. La partie du milieu est un excellent contraste, noble dans sa mélodie et ressemble à un hymne; en conservant du mouvement au drame, Haendel ré-écrit et raccourcit la première partie, plutôt que de nous offrir un «da capo» total. Le solo du soprano «Be wise, be wise at length, ye kings averse» est ravissant, doucement cadencé sur une simple ligne de continuo avant de se transformer en un chœur tout aussi attrayant. Mais ce temps de paix ne dure pas et les quatre barres «Grave» de «Or brought full low» mènent à un autre chœur belliqueux, où l’ennemi est «défait comme des moutons» («Scatter’d like sheep») et périt honteusement. Dans «Jehovah is my shield», le ténor chante sa confiance en Dieu, sur une texture orchestrale relevée par une ligne riche de la viole. La peinture d’Haendel de «I lay and slept» est particulièrement belle. Le chœur demande à ce que l’ennemi soit totalement défait dans un mouvement basé sur des morceaux du concerto en fa majeur «a due cori», dont l’orchestration des cors (qui font leur unique apparition dans l’adaptation de l’oratorio) assure que l’Acte I finit sur un mode belliqueux. Puis Haendel fait un emprunt encore plus considérable, encore que ce soit de l’une de ses propres compositions. Dans Athalia «Around let acclamations ring» accueille en grande forme le nouveau roi Joas. Dans l’Occasional Oratorio, avec un nouveau texte, «May God from whom all mercies spring», le mouvement est tout aussi spectaculaire avec sa texture de chœur à huit voix et son orchestration excessive. L’aria du ténor «Then will I Jehovah’s praise» prend également ses origines dans un autre ouvrage, la pantomime Comus: au cours de sa récupération durant l’été 1745 au château du Comte de Gainsborough, Haendel écrivit plusieurs mouvements d’une partition dont la majeure partie était d’Arne. Le chœur suivant a également été repris de cette même pantomime et les paroles changées de leur original «Happy plains» en «All his mercies shall endure». Puis vient la cadence d’un charmant solo du soprano, «How great and many perils do enfold», suivi par un duo ravissant «After long storms», qui nous rappelle beaucoup les premiers duos italiens. Le solo de la basse «To God, our strength» est un joyau. L’ouverture solennelle, hautes trompettes sur cordes lentes, nous ramène presque trente ans en arrière à la ravissante ouverture de l’Ode pour l’Anniversaire de la Reine Anne, «Eternal source of light». Cette fois Haendel répond à la trompette avec un hautbois en solo et les deux instruments s’engagent seuls dans un duo avant que le solo de la basse présente une musique glorieuse. Ici Haendel est des plus captivants. Le ton change pour «Prepare the hymn» et devient plus constant et processionnel, et Haendel introduit la mélodie du choral luthérien «Ein feste Burg». Le compositeur ordonne et construit son morceau avec une maestria magnifique; la basse présente d’abord le thème en solo, qui est repris par tout le chœur. Finalement l’ensemble, toutes trompettes et timbales sonnantes, célèbre en un style exaltant. Le solo du ténor qui suit, «He has his mansion fix’d on high», provient également de Comus, et mène à la chorale vibrante, «Hallelujah, your voices raise», qui conclut l’Acte II. La fugue qui est introduite en son milieu, «Jehovah, Lord of hosts», est belle. La troisième partie commence par une longue symphonie orchestrée en deux parties. La première partie provient du premier mouvement du Concerto grosso en sol, opus 6 No 1. Pour son deuxième mouvement, Haendel se tourne vers la Musette de son Concerto grosso en mi mineur (opus 6 No 6) qui dans ses partitions riches en cordes et mélodies glorieuses frappe par ses ressemblances au célèbre «Concerto de Noël» de Corelli. Le chœur qui suit, «I will sing unto the Lord» est l’un des chœurs les plus émouvants d’Haendel, et provient totalement d’Israël en Egypte. Arrangée pour double-chœur, c’est une musique immensément dramatique, avec ses thèmes qui s’élancent de voix à voix et qui réserve l’entrée survoltante des cuivres pour ses quelques dernières pages. Le beau solo de l’alto «Thou shalt bring them in» provient aussi d’Israël en Egypte, cette fois-ci transposé un demi-ton plus haut en fa majeur pour mener à un autre chœur splendide du même oratorio. Avec son ouverture «Grave» arrangée à seize voix, «Who is like unto thee» est aussi sensationnel que le «Lord of eternity» de Déborah et nous amène à l’un des chœurs les mieux connus du compositeur, «He gave them hailstones for rain». L’ouverture orchestrale, qui ouvre le feu avec un accord des cordes et des bois en do majeur (incluant aussi un commun do grave pour les bassons), se bâtit jusqu’à l’entrée des deux chœurs opposés, qui en viennent à une sorte de guerre musicale, exaltée par un accompagnement sauvage à l’orchestre. Le timbalier d’Haendel a dû avoir là son grand jour! Après de tels feux d’artifice de la part des chœurs, Haendel en revient à des mouvements en solo. Le soprano chante «When warlike ensigns», aux tons joliment variés, et les cornemuses pastorales de «No pasture now the plain affords» incluent aussi une autre référence oblique au patriotique «Rule Britannia» d’Arne. L’attrait d’Israël en Egypte est irrésistible et pour «The enemy said», Haendel encore une fois en reprend le mouvement complet, et assure que le solo de son ténor ait une occasion de pyrotechnique vocale auprès des autres arias plus lyriques de l’Occasional Oratorio. Pour la basse Reinhold, Haendel produit un cadre violent pour «The sword that’s drawn» qui mène à un chœur plein de verve «Millions unborn shall bless the hand». Pour La Francesina, il a écrit un arrangement charmant de «When Israel, like the bounteous Nile» et pour John Beard une aria finale pleine de défi (marquée «pomposo») «Tyrants, whom no cov’nants bind’. Avant le final, le soprano prie pour que le «balmy peace» descende sur les héros de l’Angleterre, en recyclant encore une fois une aria mélodique et pleine de charme de Comus. Le chœur n’a plus qu’à introduire les célébrations finales, ce qu’ils font avec le plus célèbre de tous les chœurs d’Haendel, l’Hymne du Couronnement de «Zadok the Priest», dont les paroles sont modifiées «Blessed are all they that fear the Lord» et dont la partie du milieu à trois temps «And all the people rejoiced» est omise. Si les cœurs anglais devaient être émus, à coup sûr aucune autre musique n’aurait pu mieux faire. 1745 war kein gutes Jahr für Händel. Als seine musikalische Saison zu zwei Dritteln vorüber war, stand es um seine Finanzen so schlecht, daß Händel, wenn er weitergemacht hätte, nahezu bankrott gewesen wäre. Wieder einmal hatte er die Bedürfnisse seines musikalischen Publikums falsch eingeschätzt: für die von ihm geplante Zahl von Oratorien-Aufführungen bestand kein Bedarf mehr, und das Resultat war, daß sich nicht nur das Bankkonto des Komponisten, sondern auch seine Gesundheit in einem schrecklichen Zustand befand. Der einundsechzig Jahre alte Händel verließ London und zog sich zur Erholung aufs Land zurück, zuerst nach Exton Hall in Lancashire, dem Sitz des Earl of Gainsborough, und dann nach Scarborough. Eine noch größere Krise braute sich in der nationalen Politik zusammen. Während König George II. entfernt in Hannover weilte, landete Prinz Charles Edward, der „Junge Prätendent“, mit seinem Heer in Schottland und begann den Marsch gen Süden. Die englische Armee wurde hastig aus Flandern zurückkommandiert, aber als Bonnie Prince Charlie im September bei der Schlacht von Prestonpans einen Sieg errang und begann, nach Süden vorzudringen, setzte in einigen Vierteln Londons fast Panik ein. Unter der Führung des Herzogs von Cumberland setzte die englische Armee sich in Bewegung nach Norden, um den Feind zu kontrontieren, und wurde dabei von einem patriotischen Eifer unterstützt, wie man ihn in der Hauptstadt seit langen Jahren nicht gesehen hatte. Es wurden Lieder zur Unterstützung der Armee geschrieben, darunter die heutige Nationalhymne, und Gluck, der im Haymarket Theatre ansässige Komponist, trug ein passend heroisches Drama bei, La Caduta de’ Giganti (welches auf ebenso wenig Begeisterung stieß wie Händels Konzertsaison). Händel, der jetzt Empfänger einer Pension des königlichen Hofes war, fühlte sich dazu verpflichtet, eigene musikalische Beiträge zu liefern, doch endete das Jahr trotz der Niederlage der Jakobiter in Derby im Dezember mit einer noch immer ziemlich unentschiedenen politischen Situation. Erst lange nach Beginn des nächsten Jahres kam es zu einer militärischen Lösung, als nämlich Cumberland, der Sohn George II., das Invasionsheer bei der entscheidenden Schlacht von Culloden vollkommen besiegte und sich damit den Spitznamen „Schlächter Cumberland“ erwarb. Um die sinkende Moral in London wieder zu beleben, bedurfte es eines größeren musikalischen Werkes. Händels neues Werk scheint etwas in Eile komponiert worden zu sein. Wie immer scheute der Komponist sich nicht, gutes Material aus früheren Arbeiten wiederzuverwenden. Es besteht Verwirrung darüber, wer der Librettist des Gelegenheitsoratoriums war. In einer Fußnote zur Arie „O liberty, thou choicest treasure“ in der ersten Ausgabe des Judas Makkabäus (der seine erste Aufführung im April 1747 erlebte) heißt es: „Die folgende Arie wurde für diese Stelle entworfen und geschrieben, aber landete dann, ich weiß nicht wie, im Gelegenheitsoratorium, wo sie unvergleichlich gesetzt und genauso kunstvoll ausgeführt wurde.“ Der Autor des Judas war Thomas Morell, doch deuten alle anderen Anzeichen darauf hin, daß Hamilton Newburgh Händels Librettist für das Gelegenheitsoratorium war. Vielleicht arbeitete Morell bereits am Judas und Händel, der sich ganz der jetzt dringlicheren Komposition widmete, entnahm den Satz zusammen mit Morells Text einfach dem Oratorium und baute ihn in Newburghs Texts ein. (Merkwürdigerweise wurde „O liberty“ erst bei dessen dritter Aufführung in den Judas eingefügt.) Die Tatsache, daß Händel direkt aus Athalia entnommene Musik (und Text) in den zweiten, und aus Israel in Ägypten entnommene Musik und Text in den dritten Akt einbezog, legt nahe, daß er nichts dabei fand, die Werke einer Reihe von Autoren miteinander zu vermischen. Trotz dieser Tirade, die vielleicht nicht ohne einen Hauch von beruflicher Eifersucht geschrieben wurde (Jennens hatte schließlich schon dreimal als Oratorienlibrettist mit Händel zusammengearbeitet, darunter am Messias) kündigte der General Advertiser vom 14. Februar 1746 an, daß „Im Theatre Royal in Covent Garden heute ein neues Gelegenheitsoratorium aufgeführt wird“. Weitere Aufführungen fanden am 19. und 26. Februar statt, und das Werk wurde (mit einigen Revisionen) noch dreimal im März des folgenden Jahres, kurz vor den ersten Aufführungen des Judas Makkabäus, erneut auf die Bühne gebracht. Wie wir sahen, wurden im Zusammenhang mit den Inszenierungen von 1746 nur drei Gesangssolisten genannt, doch muß zumindest ein weiterer Solist anwesend gewesen sein, auch wenn er nur das Duett „After long storms“ gesungen hat. Im Jahre 1747 nahmen Elisabetta de Gambarini und Caterina Galli beide als Sopranistinnen teil. Diesen Präzedenzfall haben wir in dieser Aufzeichnung benutzt, und haben überdies zwei tiefgesetzte Arien einer Altstimme zugewiesen: abgesehen davon bietet die für diese Tonaufzeichnung verwendete Aufführungsform die Sätze, die in der Vorstellung von 1746 zu hören waren. Sie irren sich in bezug auf das Gelegenheitsoratorium, das zum größten Teil aus Milton & Spencer transkribiert ist, hauptsächlich jedoch aus Milton, der in seiner Fassung einiger der Psalmen so sehr in der Manier von Sternhold & Hopkins schrieb, daß nicht der geringste Unterschied zwischen ihnen existiert. Aber es gibt Leute auf der Welt, die alles schön finden, was Miltons Namen trägt. Ich glaube, Hamilton hat nicht viel mehr getan als Abschnitte zusammenzustoppeln, was er mit seinem üblichen Geschmacksurteil tat & hat so ein Oratorium aus Fetzen und Flicken zusammengebraut. Mit seinem eigenen Eingeständnis, daß er keine Vorstellung besuchen werde, versicherte Jennens, daß er mit derselben Benachteiligung schrieb wie sie andere Schreiber nach ihm erlitten: er mußte Händels Werk beurteilen, ohne es tatsächlich gehört zu haben. Sogar wenn wir einige seiner kritischen Bemerkungen über das Libretto akzeptieren, leisten wir dem Werk einen schlechten Dienst, wenn wir ihm mit der Erwartung begegnen, ein lebensvolles opernhaftes Drama zu finden. Stattdessen präsentiert Händel eine Reihe dramatischer Tableaux. Darunter finden sich ein paar atemberaubende Chorpartien, sechs erstklassige Sätze für Orchester und eine ansehnliche Vielfalt von Arien. Und für die, die sich im Hinblick auf Händels Musik gern als Detektive betätigen, gibt es eine reiche Fülle von musikalischen Spuren, denen sie folgen können. Hier haben wir es, kurz gesagt, mit einem weiteren glänzenden, zu unrecht vernachlässigten Händelschen Oratorium zu tun. Die Ouvertüre zum Gelegenheitsoratorium hat einen starken, viersätzigen Charakter. Das Grave zu Beginn und die dann folgende kunstvolle Fuge waren wahrscheinlich anläßlich der Wiederaufführung der Deborah im Jahre 1744 geschrieben worden: das Allegro enthält außerdem ein Thema aus der Ouvertüre zu Telemanns Troisième Production der Musique de Table, einer Quelle, der sich Händel auch in den Orgelkonzerten zuwandte. Neu komponiert wurde der dritte Satz, ein Adagio in h-moll mit einer herrlichen Melodielinie für Händels ersten Oboisten; Händel schließt, den kriegerischen Ursprüngen des Werks eingedenk, mit einem packenden Militärmarsch. Um ohne Unterbrechung mit dem Drama fortfahren zu können, verzichtet Händel auf einen einleitenden Chor und präsentiert stattdessen ein Baßsolo „Why do the gentiles tumult“, dessen starke Rhythmen, wiederholte Figurierungen für die Streicher und Interpolationen für die Holzbläser einen passend militaristischen Ton einschlagen. Der Chor setzt mit dem ersten von drei Kreuzfahrer-Gesängen ein, in dem die forschen Rhythmen von „And cast from us“ [werfen wir ab] durch den verzögerten Einsatz von Trompeten und Trommeln überboten werden. Der Tenor spielt eine sanft heldenhafte Rolle im Oratorium, und seine eröffnende Arie „O Lord, how many are my foes“ ist besonders ansprechend mit ihren wiederholten Streicherakkorden, die von einem weiteren entzückenden Oboensolo noch übertroffen werden. Der Chor antwortet mit einer weiteren, sehr abgekürzten Version von „Him or his God we not fear“, auf welche der Tenor mit einer anderen bittenden Arie „Jehovah, to my words give ear“ antwortet, diesmal im Duett mit einem Solocello. Der Chor beendet die erste Episode mit einer erneuten Wiederholung des schaukelnden Schlachtgesangs, und dessen Dringlichkeit wird dadurch angedeutet, daß Trompeten und Trommeln von Anfang an mit dabei sind. Die nächste Szene wird vom Baß angekündigt, der die Paraphrase der kriegerischen Worte aus Psalm 2 fortsetzt. Die Sopranistin setzt mit dem sanfte Arioso „O, who shall pour into my swollen eyes“ ein, in dem die Verfehlungen der Welt beklagt werden, aber auch sie nimmt bald das kriegerische Thema mit der feurigen Arie „Fly from the threat’ning vengeance, fly!“ auf. Dessen virtuose Läufe müssen La Francesina (die französische Sopranistin Elisabeth Duparc), die Sängerin der ersten Aufführung, begeistert haben. Der Satz war eine Entleihung aus den Inszenierungen des Samson aus dem Jahre 1745, in denen Miss Robinson, die Enkelin des berühmten Purcellschen Kontratenors William Turner, ihn mit seinem Originaltext, „Fly from the cleaving mischief“ sang. Der Solobaß (ursprünglich Thomas Reinhold) kehrt mit dem Accompagnato „Humbled with fear“ und der großartigen Arie „His sceptre is the rod of righteousness“ zurück: die Wiedereinführung von Harmonie nach Passagen des Einklangs von Gesangsstimme und Streichern läßt den „great Dragon“ [das Ungeheuer], der „strongly doth repress“ um so anschaulicher werden. Der Mittelteil bildet mit seiner edlen, an ein Kirchenlied erinnernden Melodie einen kunstvollen Gegensatz hierzu; um die Dramatik in Bewegung zu halten, schreibt Händel den ersten Abschnitt um und kürzt ihn, statt ein vollständiges „da capo“ zu liefern. Das Sopransolo „Be wise, be wise at length, ye kings averse“ ist ein entzückendes Kunstwerk. Mit seiner simplen Continuo-Linie trällert es sanft dahin, bis es zu einem gleichermaßen ansprechenden Chor umgeformt wird. Aber die friedliche Stimmung hält nicht an, und die vier „grave“ gespielten Takte von „Or brought full low“ führen zu einer weiteren kriegerischen, vom Chor gesungenen Passage, in der die Feinde „Scatter’d like sheep“ [zerstreut wie die Schafe] werden und schändlich verrecken. In „Jehovah is my shield“ singt der Tenor von seinem Vertrauen auf Gott, und die orchestrale Struktur wird durch eine üppigen Violenlinie verstärkt. Händels Schilderung von „I lay and slept“ [ich legte mich zur Ruhe und schlief] ist besonders gelungen. In einem Satz, der auf Material aus dem Konzert in F-Dur „a due cori“ basiert, fordert der Chor einen vollkommenen Sieg über die Feinde. Die Spartierung dieses Satzes für Hörner (die hier ihren einzigen Auftritt innerhalb der Oratorien-Adaption haben) gewährleistet, daß der 1. Akt auf kriegslüsterne Weise ausklingt. Händels nächste Entleihung war extensiver, wenn sie auch wenigstens aus einer seiner eigenen Kompositionen stammte. In Athalia grüßt „Around let acclamations ring“ den neugekrönten Joas auf majestätiche Weise. Im Gelegenheitsoratorium ist der Satz mit seinem neuen Text „May God, from whom all mercies spring“ in seiner achtstimmig choralen Struktur und seiner üppigen Orchestrierung ebenso spektakulär. Die Tenorarie „Then will I Jehovah’s praise“ stammt ebenfalls aus einem anderen Werk, nämlich der Maske Comus: während er sich im Sommer 1745 auf dem Landsitz des Earls von Gainsborough erholte, trug Händel eine Handvoll Sätze zum Finale einer größtenteils von Arne stammenden Partitur bei. Der folgende Chorgesang wurde demselben Maskenspiel entnommen und sein Text war vom ursprünglichen „Happy plains“ zu „All his mercies shall endure“ umgeändert worden. Als nächstes folgt ein reizend trällerndes Sopransolo, „How great and many perils do enfold“, nach dem das bezaubernde Duett „After long storms“ zu hören ist, das sehr an frühe italienische Duette anklingt. Das Baßsolo „To God, our strength“ ist ein wahres Juwel. Seine feierliche Einleitung, in der hohe Trompetentöne über langsam dahintreibenden Streichern zu hören sind, hatte seine Ursprünge in der fast dreißig Jahre zuvor entstandenen reizvollen Einleitung zur Geburtstagsode für Queen Anne, „Eternal source of light“. Diesmal antwortet Händel der Trompete mit einer Solo-Oboe, und dann wetteifern die beiden Holzbläser in einem privaten Duett, bis der Solobaß mit herrlicher Musik einsetzt. Fesselnder als hier ist Händels Musik selten. Bei „Prepare the hymn“ wird die Atmosphäre stetiger und trägt den Charakter einer Prozession, und dann läßt Händel die lutherische Choralmelodie „Ein feste Burg“ erklingen. Der Komponist gestaltet diese allmähliche Steigerung auf eindrucksvolle Weise, indem er das Thema zuerst vom Solobaß und dann vom vollen Chor vortragen läßt. Schließlich feiert dann das gesamte Ensemble—komplett mit schallenden Trompeten und Pauken—auf sehr bewegende Weise. Das dann folgende Tenorsolo „He has his mansion fix’d on high“ wurde auch aus dem Comus ausgeliehen und leitet über zu einem ergreifenden choralen Schlußgesang, der Akt II beschließt, „Hallelujah, your voices raise“. Im Mittelpunkt dieses Werkabschnitts steht „Jehovah, Lord of hosts“, eine kunstvolle Fuge. Der dritte Teil beginnt mit einer ausgedehnten, zweiteiligen orchestralen Sinfonie. Ihr erster Abschnitt ist dem ersten Satz des Concerto grosso in G, Op 6 Nr. 1 entnommen. Beim zweiten Satz wandte sich Händel der Musette seines Concerto grosso in Es (Op 6 Nr. 6) zu, die in ihrer üppigen Spartierung für Streicher und ihren herrlichen Melodien Corellis berühmtem „Weihnachtskonzert“ auffallend ähnelt. Der dann folgende Chorgesang „I will sing unto the Lord“ ist eines von Händels faszinierendsten Werken dieses Genres und wurde ganz und gar dem Oratorium Israel in Ägypten entliehen. Diese für Doppelchor gesetzte Musik ist hochdramatisch. Sie schleudert ihre Themen von einer Stimme zur anderen und spart sich den aufsehenerregenden Einsatz des Basses bis zu den letzten paar Seiten auf. Auch das vollendete Altsolo „Thou shalt bring them in“ wurde aus Israel in Ägypten entliehen und ist hier einen Halbton höher nach F-dur transponiert, um zu einem anderen herrlichen Chorgesang aus demselben Oratorium überzuleiten. Mit seiner „grave“ gesungenen Eröffnung, die für sechzehn Stimmen spartiert ist, klingt „Who is like unto thee“ ebenso sensationell wie „Lord of eternity“ in Deborah, und leitet über zu einem der bekanntesten Chorgesänge, „He gave them hailstones for rain“. Die orchestrale Einleitung, die einen C-Dur-Akkord zwischen die Streicher und die (mit einem von den Fagotten gespielten vulgaren Grundton C kompletten) Holzbläser schleudert, ragt in den Einsatz zweier gegensätzlicher Chöre hinein, die etwas betreiben, was man nur als musikalischen Krieg bezeichnen kann. Dabei werden sie von einer wilden orchestralen Begleitung angetrieben. Händels Paukenspieler wird diese Gelegenheit genossen haben! Nach einem derartigen choralen Feuerwerk kehrt Händel zu Solosätzen zurück. Der Sopran nimmt den Gesang von „When warlike ensigns“ auf. Diese Arie wird in ihren Stimmungen hübsch variiert, und enthält außerdem pastorale Dudelsackklänge in der Zeile „No pasture now the plain affords“, die einen weiteren versteckten Bezug zu Arnes patriotischem „Rule Britannia“ enthalten. Die Verlockung von Israel in Ägypten erwies sich als unaufhaltsam, und Händel entlehnte wieder einmal den kompletten Satz und versicherte dadurch, daß der Tenorsolist die Gelegenheit erhielt, neben den anderen, eher lyrischen Arien des Gelegenheitsoratoriums ein brillantes vokales Feuerwerk erklingen zu lassen. Für den Bassisten Reinhold lieferte Händel einen stürmischen Satz von „The sword that’s drawn“, der zu dem beschwingten Chor „Millions unborn shall bless the hand“ führt. Für La Francesina verfaßte er einen reizenden Satz von „When Israel, like the bounteous Nile“, und für John Beard eine trotzige Schlußarie (mit der Anweisung „pomposo“), „Tyrants, whom no cov’nants bind“. Vor dem Finale fleht der Sopran, daß „balmy peace“ [lieblicher Friede] auf Englands Kriegshelden herniedersteigen möge, und setzt damit wieder einmal eine hübsch melodische Arie aus dem Comus in Umlauf. Dann bleibt es dem Chor überlassen, die Schlußfeierlichkeiten einzuleiten, und er tut dies mit dem berühmtesten aller von Händel komponierten Chorgesänge, der Krönungshymne „Zadok der Priester“, die hier den Wortlaut „Blessed are all they that fear the Lord“ hat, und deren im Dreiertakt stehender Mittelteil „And all the people rejoiced“ hier ausgelassen ist. Wenn englische Herzen gerührt werden sollten, dann hätte sicherlich keine andere Musik diese Aufgabe besser erledigt. Against the Lord and his Annointed. chaque pays contre le Seigneur et son Oint. wider den Herrn und seinen Gesalbten. The twisted cord and iron band! Him or his God we scorn to fear. la corde torse et le ruban de fer! Lui ou son Dieu nous refusons de craindre. ab ihre Stricke und eisernen Bande! Ihn oder seinen Gott spotten wir der Furcht. How many that in arms against me rise! No help for him in God there lies. Ô Seigneur, combien sont mes ennemis! il n’est ici pour lui aucun secours en Dieu. wie viele stehen mir entgegen. für den ist keine Rettung bei Gott. Act 1 No 05. Chorus: Him or his God we not fear! Him or his God we not fear! Lui ou son Dieu nous ne craignons point! Ihn oder seinen Gott fürchten wir nicht! To thee alone, my God and King, I pray. toi seul je prie, mon Roi et mon Dieu. mein Gott und König, gilt mein Gebet. Act 1 No 07. Chorus: Him or his God we scorn to fear! Him or his God we scorn to fear! Lui ou son Dieu nous refusons de craindre! shall laugh them to scorn. (though ye rebel) on Sion’s holy hill. rira de ceux qui le dédaignent. vous rebelliez) sur la colline sacrée de Sion. (auch wenn ihr aufbegehrt) auf Sion, meinem heiligen Berge. A sea of tears that never may be dried? Pierce the dull heavens, and fill the air so wide! To wail the misery of the world impure! une mer de larmes qui jamais ne pourra s’assécher? percer les cieux monotones, et emplir l’air tout entier! pour pleurer les souffrances du monde impur. ein Meer von Tränen, die nie versiegen? durchdringt die trüben Himmel und die Luft erfüllt. das Leid der unreinen Welt zu beklagen. Fly from the threat’ning vengeance, fly! The bolt once launch’d, ye surely die. Who lift their hands so high. Fuis la vengeance menaçante, fuis! une fois l’éclair lancé, la mort sera certaine. qui lève si haut les mains. Entfliehe der drohenden Rache, fliehe! Bevor es zu spät ist, dem Schicksal zu entrinnen. Wenn der Pfeil einmal verschossen ist, wirst du sicher sterben. die ihr Haupt so hoch halten. Thou turn to nought, and quite confounded be. d’être anéanti, et sois-en alarmé. dienet dem Herrn mit Furcht und huldiget ihm. Unter Beben erweist ihm Gehorsam. wenn bald entbrennt sein Zorn. Under the rigour of his judgement just. That all about him sheddeth glorious light. sous la rigueur de son jugement vertueux. tout autour de lui se répand une éclatante lumière. mit ihm schlägt er seine Feinde zu Staub. Sein ist die Wahrheit, der die Gerechten vertrauen. taucht alles in herrliches Licht. servez Jéhovah dans la crainte. Wohlan, ihr Könige, kommet zur Einsicht. Laßt euch warnen, ihr Beherrscher der Erde. Dienet dem Herrn in Furcht. Scatter’d like sheep, ye perish in your way. tels des moutons, périssez dans votre errance. zerstreut wie die Schafe, geht ihr zugrunde. My God will rise; my help is in the Lord. viendra; mon salut est dans le Seigneur. des Volkes, die rings mich feindlich umlagern. Sie erbauen ihre Zelte gegen mich.
Erhebe dich, Herr! Schaffe mir Heil, mein Gott. The exalter of my head I count. And heard me from his holy mount. The Lord himself did me sustain. pour celui qui exalte mon esprit. et m’écouta de sa montagne sacrée. c’est le Seigneur lui-même qui me soutenait. weil der Herr mich erhält. vor dir nicht bestehen. Die Unrecht üben, du hassest sie. For against him they had rebell’d. car contre lui ils s’étaient rebellés. denn sie boten ihm Trotz. Seat of virtue, source of pleasure! siège de vertu, source de plaisir! point de tendresse digne de caresse. Schoß der Tugend, Born der Freude! keine Liebe wert der Schmeichel. Who trusts in God should ne’er despair. The just are still the care of Heaven. Rejoice, my soul, Jehovah hears. désespérer. Les justes sont toujours les protégés des Cieux. Réjouis-toi, mon âme, Jéhovah entend. Wer auf Gott vertraut, verzweifle nicht. Die Gerechten verbleiben in der Sorge des Himmels. Freue dich, meine Seele, Gott hört dein Gebet. et les triomphes après la victoire. déconfite, renonce à la terre. Jubel folgt auf den Sieg. geführt von seiner gerechten Hand. Bless the true church, and save the king! Will conquer in his cause, or fall. les bienfaits, bénisse la fidèle église, et sauve le roi! Avec des cœurs fermes et unis, tousv nous conquerrons dans sa cause, ou choirons. segne die wahre Kirche und rette den König! siegen in seinem Namen, oder fallen. And in a moment shall be quite abash’d. et en un instant se verront décontenancés. Der Herr hat mein Flehen gehört. gar schnell soll Schmach sie ereilen. Of Jehovah the most high. à jamais fidèle, à jamais sûr. And stedfast truth acquit him out of all. et l’inébranlable vérité ne l’absolvait pas de tout. den Gerechten, auf daß er falle jeden Tag. und die feste Wahrheit, die ihn erlöse. The sun at length his joyful face doth clear. Else would afflicted man despair. et les tempêtes le soleil éclaircit son visage joyeux. zeigt die Sonne endlich ihr frohes Gesicht. Sonst wäre der Bedrängte verloren. Sing loud to God our King! And harp with pleasant string. qu’on chante haut à Dieu notre Roi! qu’on fasse résonner de grandes acclamations! et la harpe avec ses douces cordes. singt laut und klar, singt das Lob des Herrn, unseres Königs. And the horn’d moon, their course to run. et la lune cornue, prissent leur course. über den Augen der Sterblichen. zu überragen die flachen Wasser? und dem blassen Mond, ihre Laufbahn anzutreten? Jehovah, Lord of Hosts, to praise. Hallelujah. pour louer Jéhovah, Seigneur des Multitudes. Alléluia. Gott unser Herr, preiset ihn. Hallelujah. Hath he thrown into the sea. il a jetés à la mer. denn er ist der Sieger. Which thy hands have established. que tes mains ont établi. die du dir geschaffen als Wohnung. Act 3 No 04. Chorus: Who is like unto thee, O Lord? Fearful in praises, doing wonders! He gave the Egyptians storms for rain. Ran along upon the ground. Qui est tel que Toi, ô Seigneur, parmi les Dieux? redouté dans la louange, auteur de merveilles! Aux Egyptiens il donna pour pluie des tempêtes. se répandit sur le sol. Wer ist wie du, o Herr, unter den Götzen? Wer ist wie du, großartig in deiner Heiligkeit? Den wir preisen, der Wunder tut? Den Ägyptern gab er Sturm anstatt Regen. Er gab ihnen Hagel anstatt Regen. For corn an iron harvest yield. And scythes are straighten’d into swords. To future good our present woes. donner une moisson de fer au lieu de blé. redresse les faux pour en faire des épées. pour un bien à venir, de nos malheurs présents. auf dem Feld anstatt Korn. das heutige Böse in das Gute von morgen verwandeln. My lust shall be satisfied upon them. I will draw my sword: my hand shall destroy them. j’étancherai ma soif sur eux. Je tirerai l’épée: ma main les détruira. ich werde stürmen, ich werde die Beute zerteilen. ziehen: meine Hand wird sie zerschmettern. And joy succeeds the fear. That gave deliv’rance to the land. et la joie succède à la peur. a main qui délivra le pays. soll schützen unser Land und seine Gesetze. rufen wir den Himmel an. Und Freude überwindet die Furcht. Increas’d the river’s swelling tide. s’ajoutèrent à la marée gonflant le fleuve. die steigenden Wogen des Flusses. To free the world, and break the oppressor’s chains. la religion, la liberté, et la loi. le monde, et de briser les chaînes de l’oppresseur. seine Religion, seine Freiheit und sein Gesetz. die Welt zu befreien, die Ketten der Unterdrücker zu sprengen. Whose God and people are his care. celui qui à Dieu et au peuple se consacre. dessen Gott und Volk er dient. Blessed are all they that fear the Lord. May the King live for ever! Bénis soient ceux qui craignent le Seigneur. que le Roi vive pour toujours! Glücklich diejenigen, die den Herrn fürchten. Gott schütze den König, lang lebe der König. Auf daß der König ewig lebe.